Every battlefield troop maintains a fraction of personnel who are well-trained and proficient in conducting first aid. 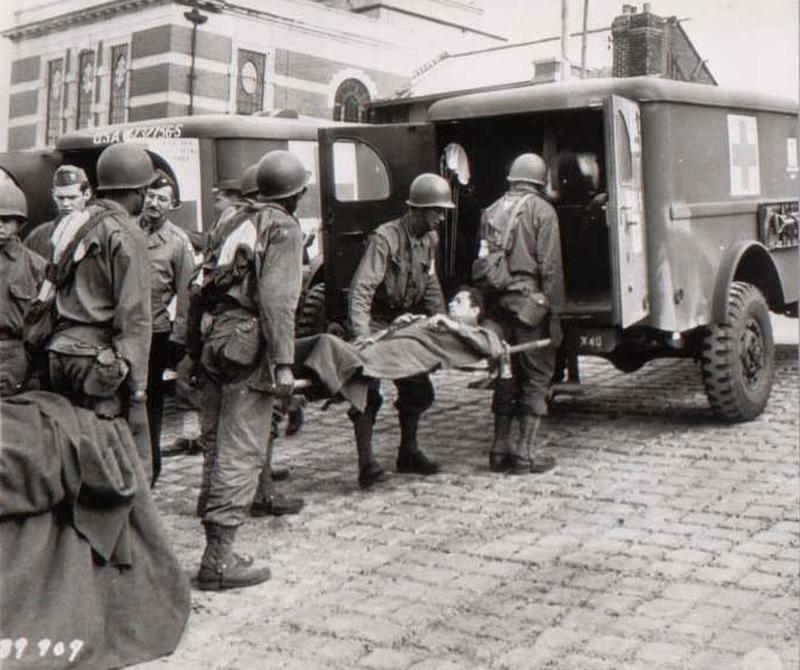 In a unit that is as large as an Infantry battalion, there is always number of stretcher-bearers, who will provide the local transport using stretchers, to collect the injured men of the unit. 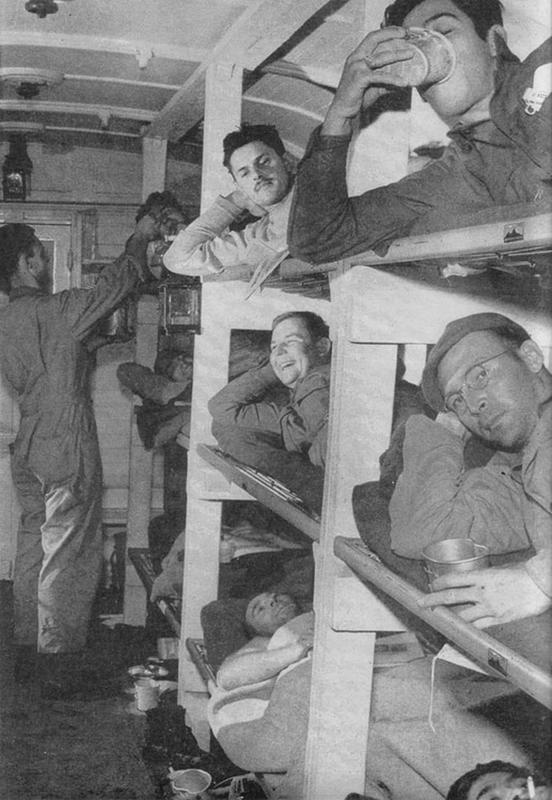 The Medical Service is built up based on the principle that the troops in the field are kept fit for service. Now when they become unfit, evacuation from the field of operation is needed as quickly as possible. The number of sick and wounded who are present proves to be a ball and chain to a Commander, and since his missions will be handicapped and compromised because he will be compelled to carry a number of unfit men, all efforts are utilized to remove them to the lines of communication. 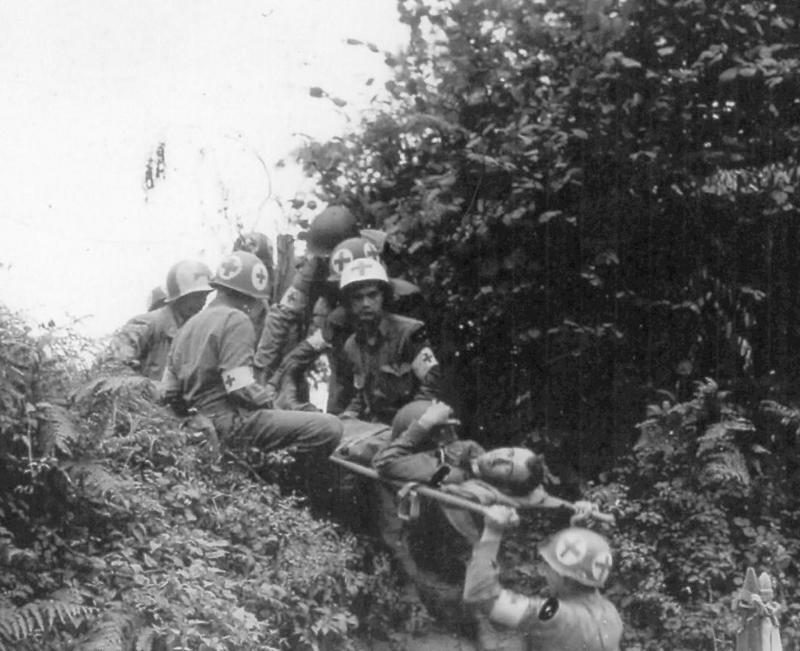 Normandy summer of 1944; a Litter-patient is being painstakingly evacuated amidst difficult terrain. Note the enormous variety of Geneva Convention helmet markings. 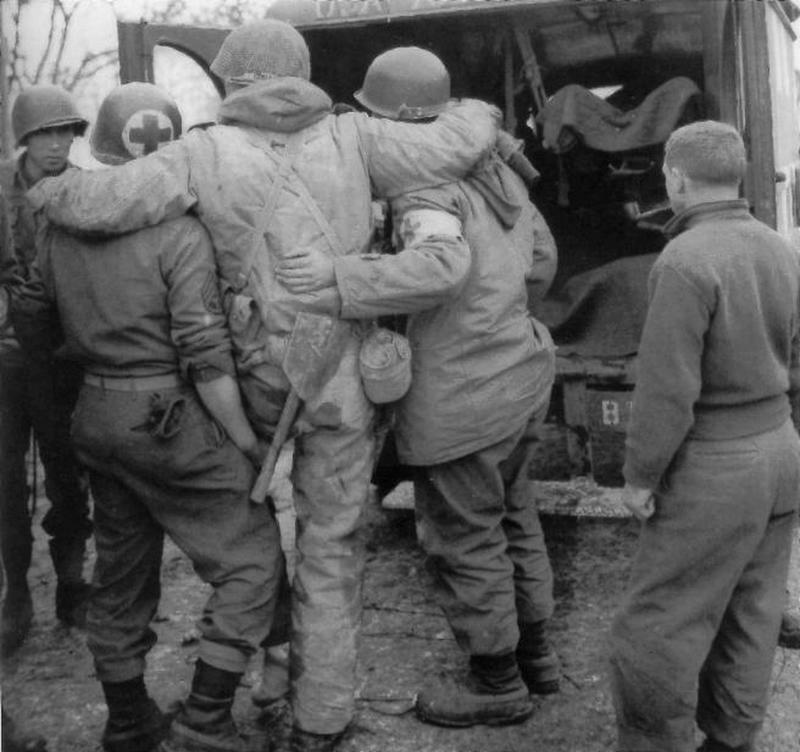 Medics are lifting a wounded doughboy to a waiting Ambulance, for further evacuation, the Bulge, Belgium, January-February 1945. 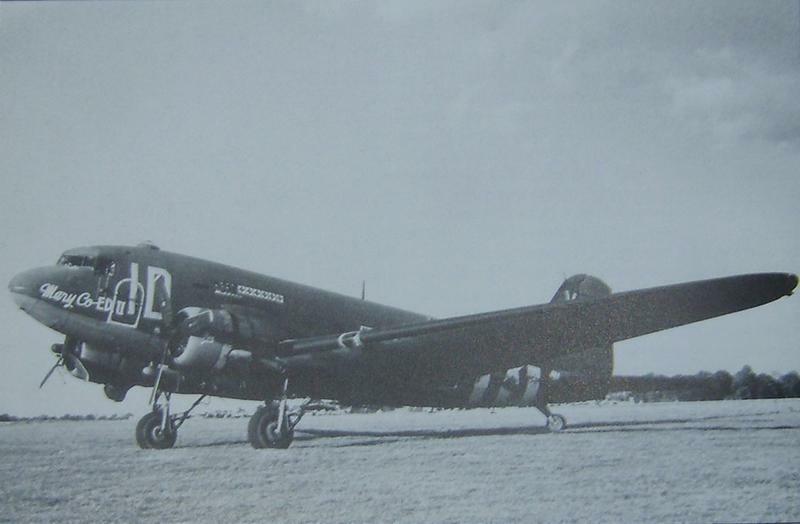 Image showing C-47 "Mary Co-Ed II", this was used as a medevac aircraft during the Normandy campaign. The number of missions she has flown are entirely visible by the presence of the painted red crosses just underneath the cockpit. 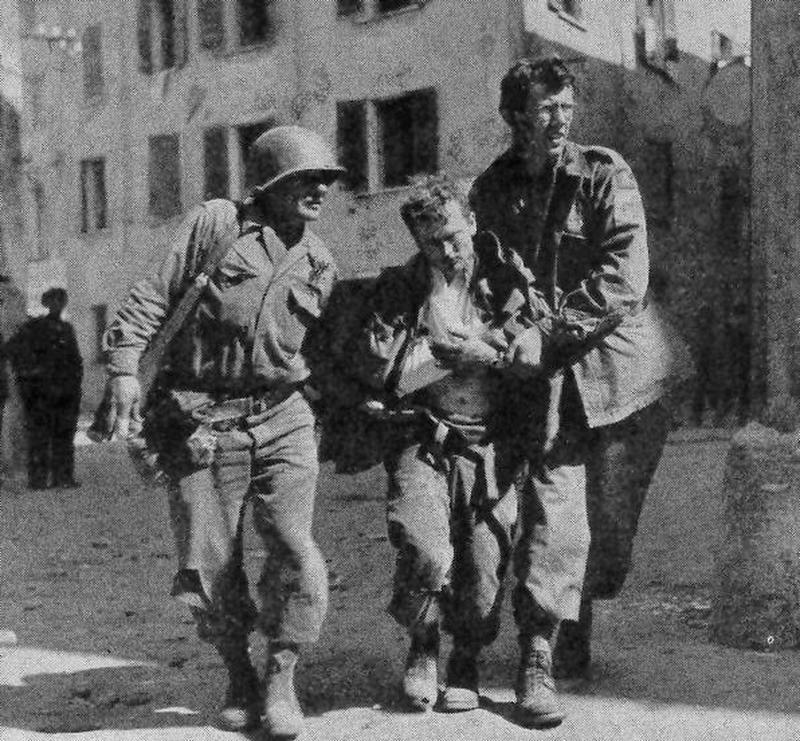 First US Army Litter Bearers aided by AAF personnel carry a wounded German PW aboard a CG4A Waco Glider. Picture taken in Germany by spring of 1945. 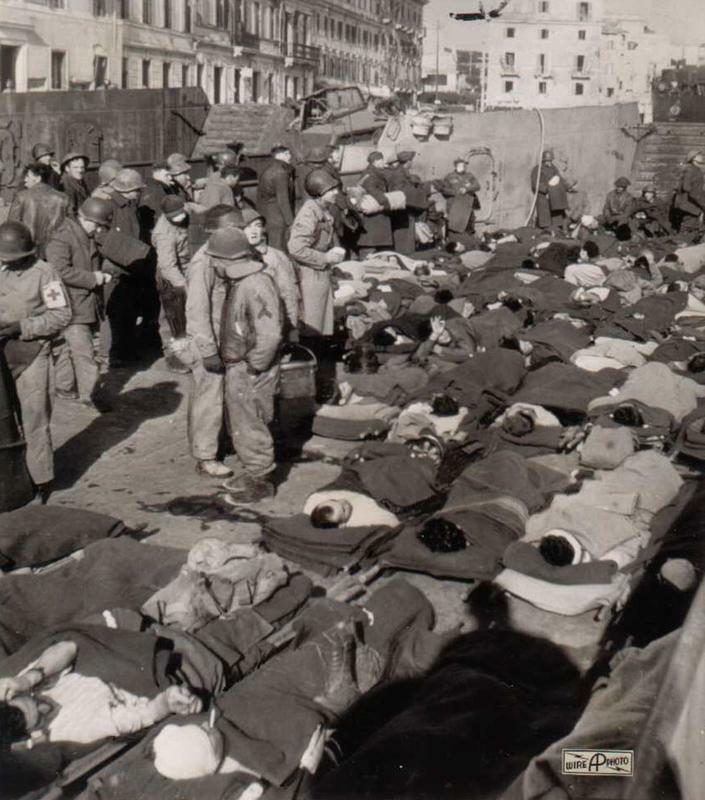 An "Associated Press" photograph showing wounded American and German soldiers awaiting transport to England following savage fighting in Europe. 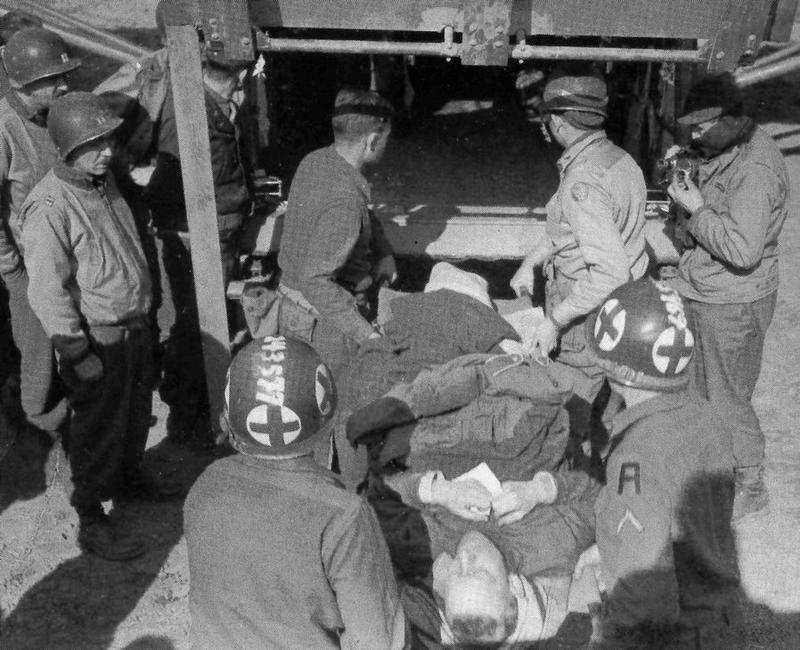 A wounded GI is transported to an Evacuation Hospital via ambulance in Italy. The litter bearer treads cautiously in the mud, as the casualty is taken to the Receiving Ward. 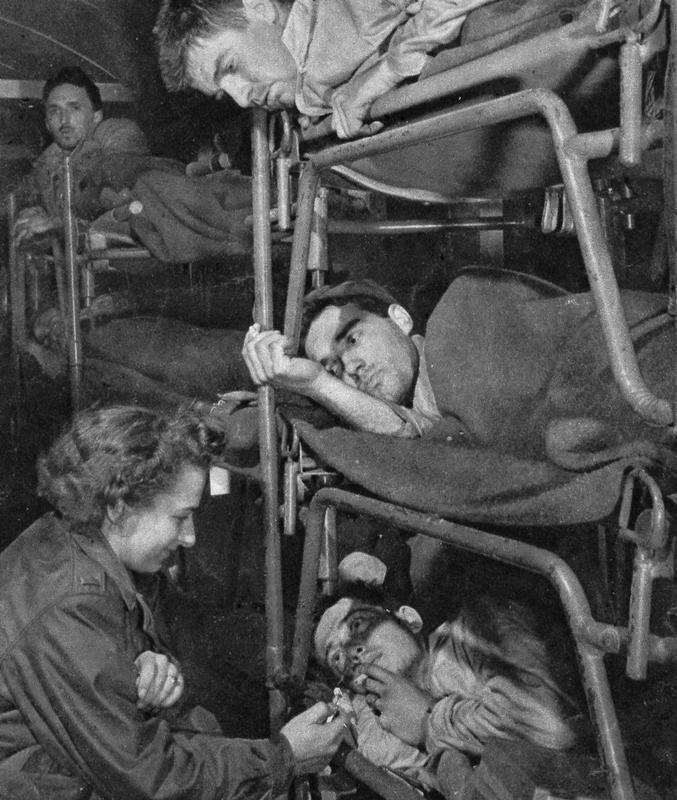 American soldiers await evacuation by ambulance going to the next echelon on medical care. A French civilian hands out cigarettes and matches to the G.I.s; of interest is the detail that she bears the wool knit "Jeep Cap". 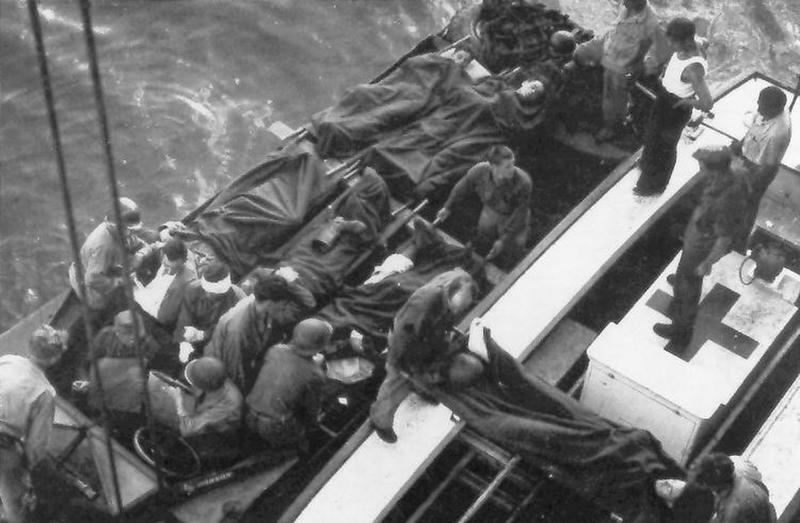 Off Utah Beach, Normandy, injured individuals are transferred from a DUKW to a Water Ambulance (British LCA) for embarkation on the British Hospital Carrier "Prague". Picture dated July 10, 1944. 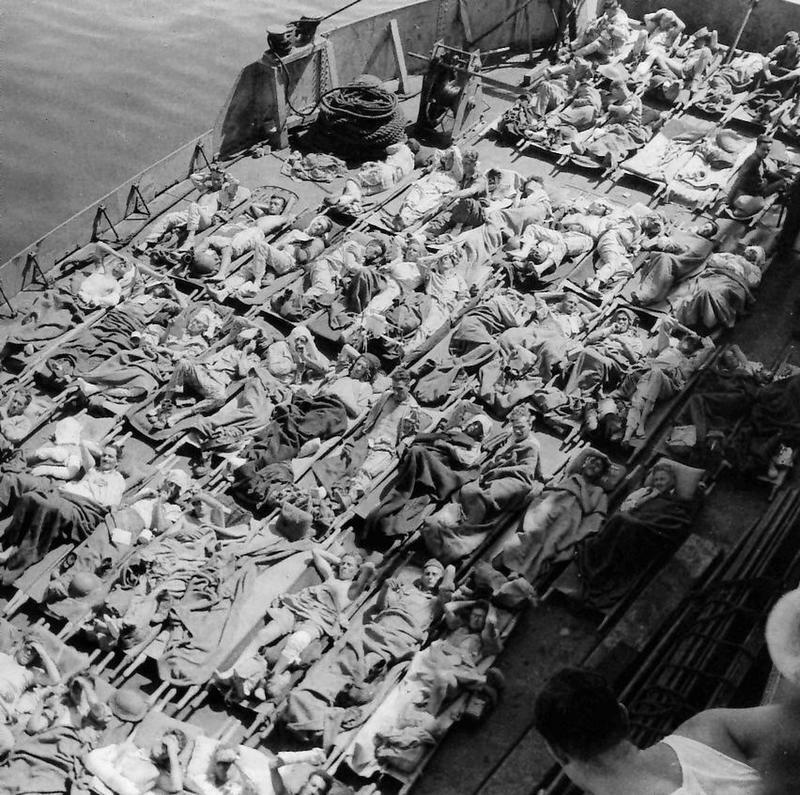 Allied casualties evacuated by American landing craft to a Hospital Ship. Picture taken after Operation Husky (Invasion of Sicily). 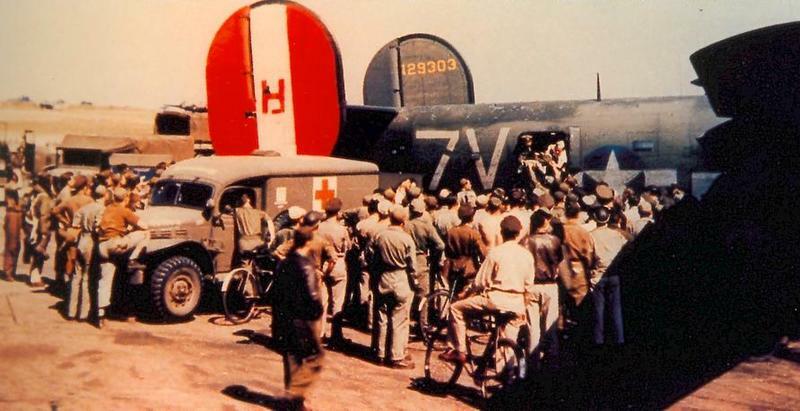 Wounded crew members of a B-24 "Liberator" bomber are being transferred from the aircraft. They will be taken to a Base Hospital by an available Ambulances (WC-54 3/4-Ton Vehicle). 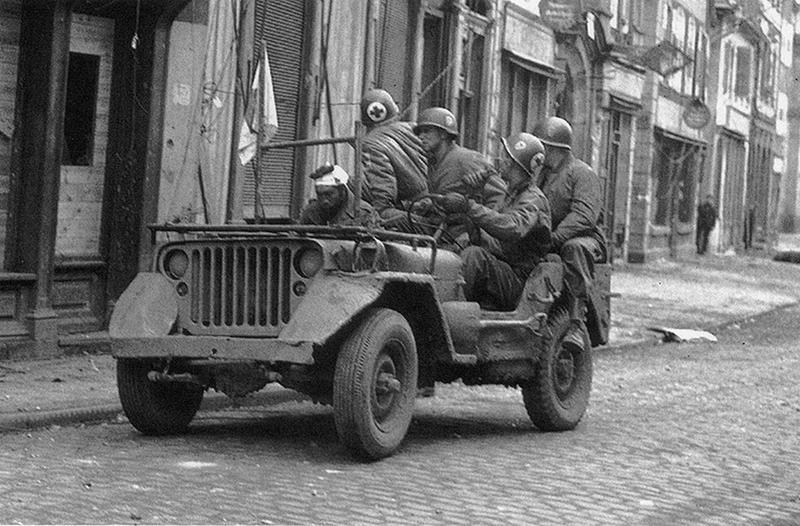 Medical troops evacuated a wounded comrade in a Jeep designed with Red Cross Markers. 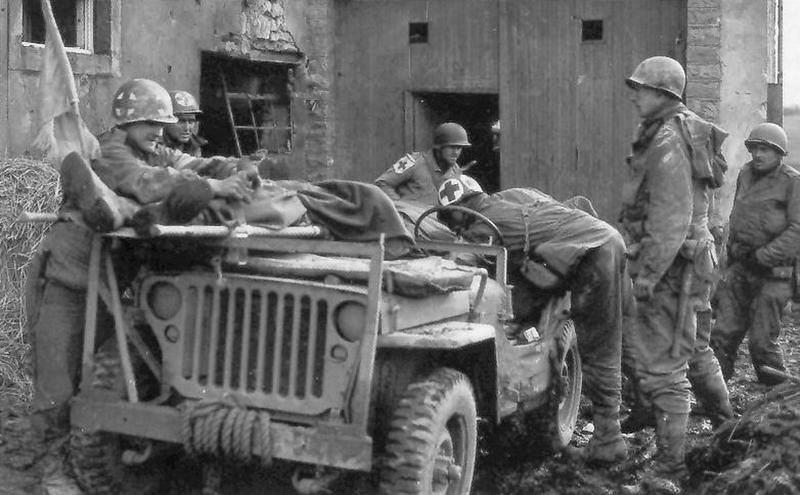 The wounded man and medical personnel pertain to the 36th Infantry Division. This image was taken March, 1945, near Haguenau, France. 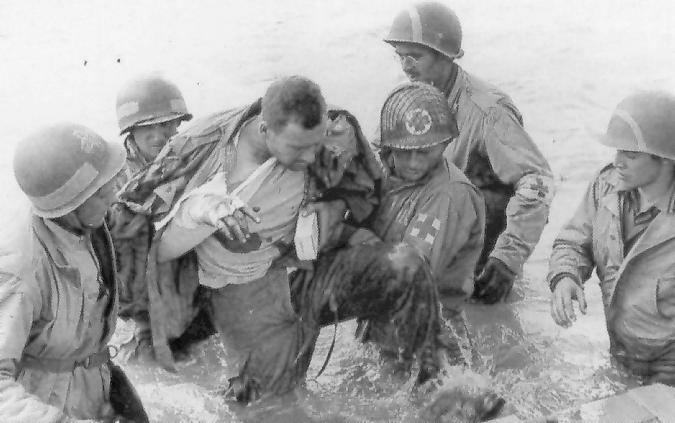 Utah Beach, Navy Hospital Corpsmen and 1st ESB medics transferring a wounded soldier to a landing craft. Picture captured during D-Day, June 6, 1944. Field Ambulances and Air Evacuation; different arms and varied services, yet they work well together, and as always the patient comes first! Air evacuation by C-47. 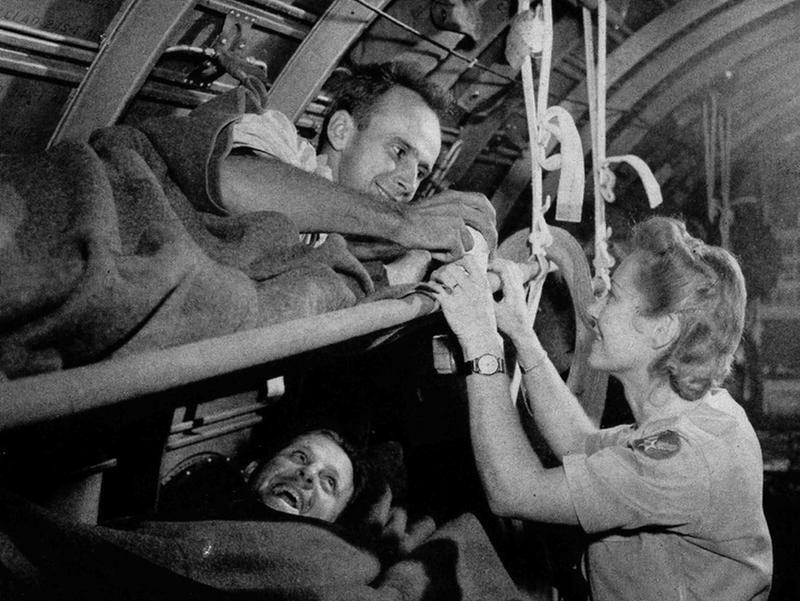 Patients are being flown from a medical holding facility in Germany to a General Hospital in France, March 1945. Illustration of an evacuation by Ambulance Jeep. An injured individual is being secured to the Litter, strapped to the frame and bracket in the front part of the vehicle. E.T.O. fall of 1944. 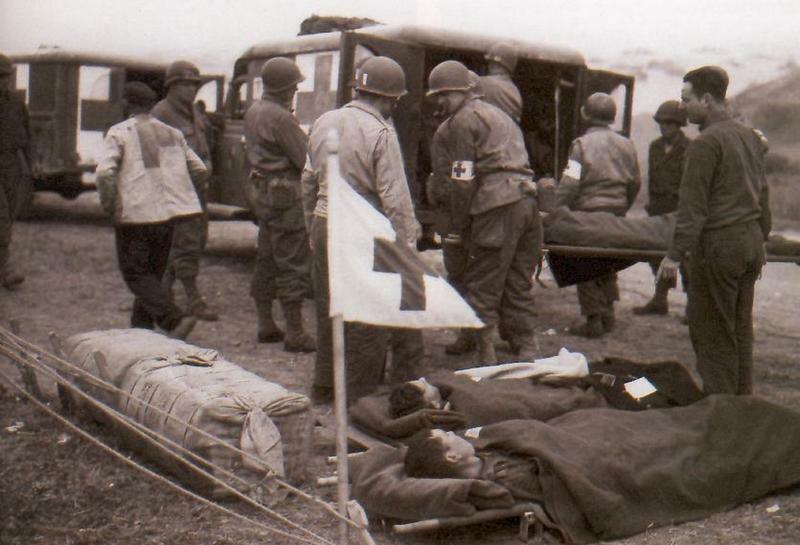 Evacuation of wounded enemies by American Ambulances, Omaha Beach, June 1944. 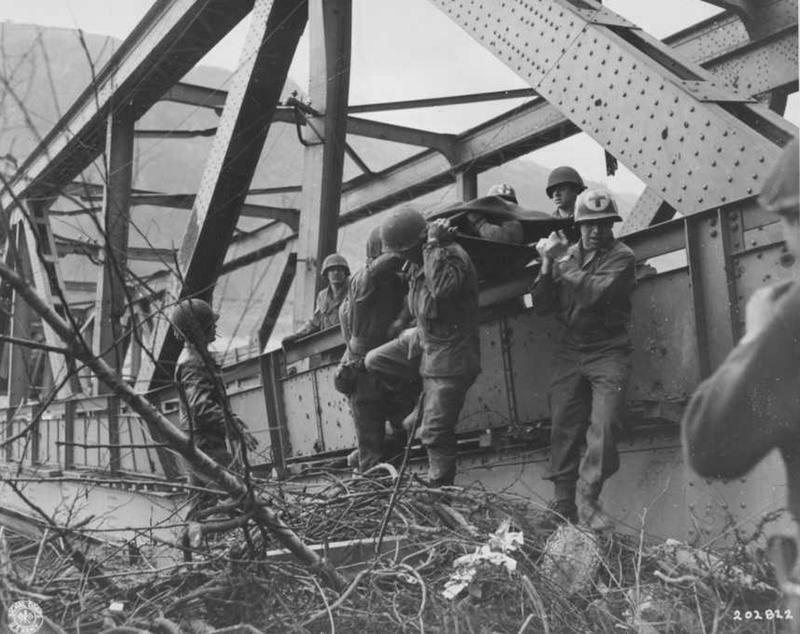 Medical troops evacuate wounded American soldiers off the bridge at Remagen after the collapse of the bridge. Once again, observe the variation in medical helmet markings. Photograph taken on March 17th, 1945. 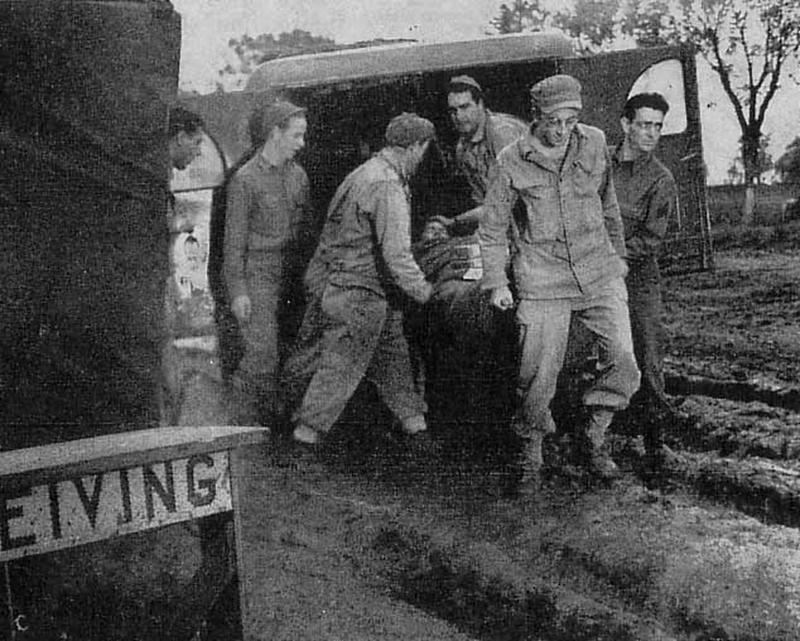 A wounded American serviceman is evacuated, via WC54 Ambulance to a Hospital somewhere in England. He has already been transferred by ship from the Normandy coast. Photograph taken June 12, 1944. 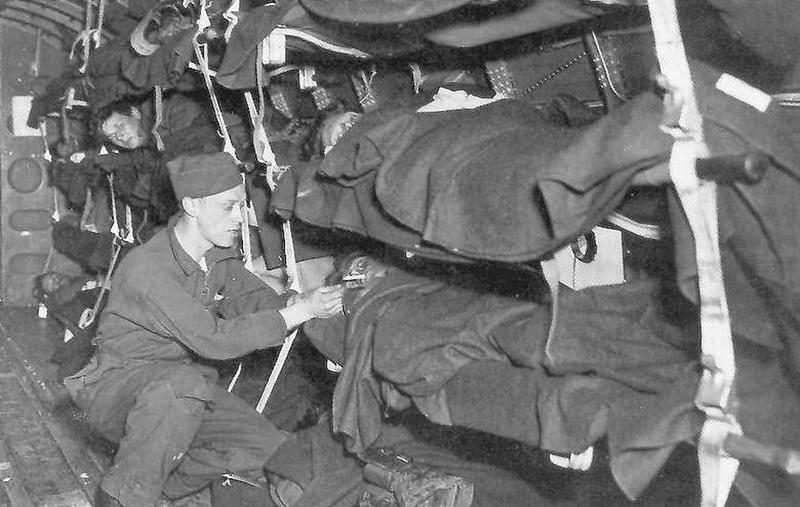 Army Nurse, Lt. Marie Pickhardt on board a Hospital Train. Everyday, she travels all over France with patients, assisting with evacuation of casualties from the front to rear Hospitals. Picture taken in December 1944. Mid June 1944 within Omaha Beach . 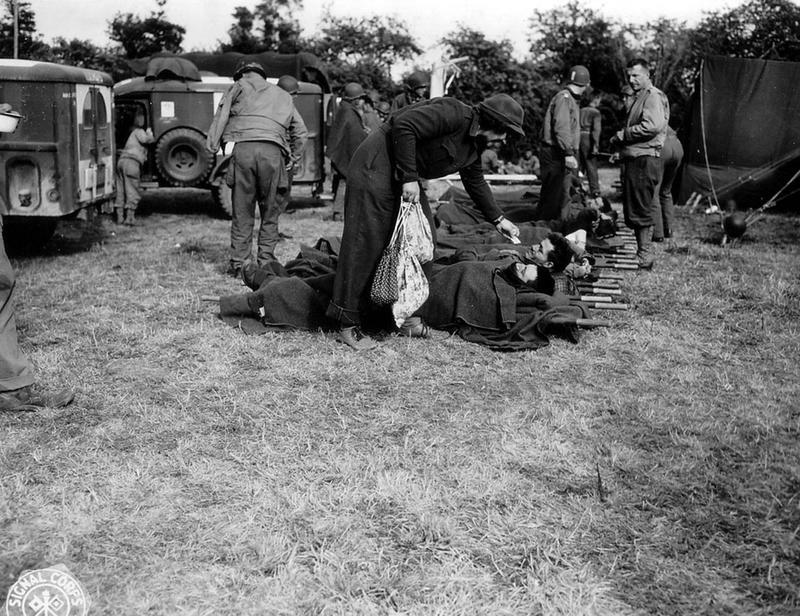 Casualties are being evacuated from a WC-54 Ambulance (5th ESB medical unit) onto a C-47 plane to England. 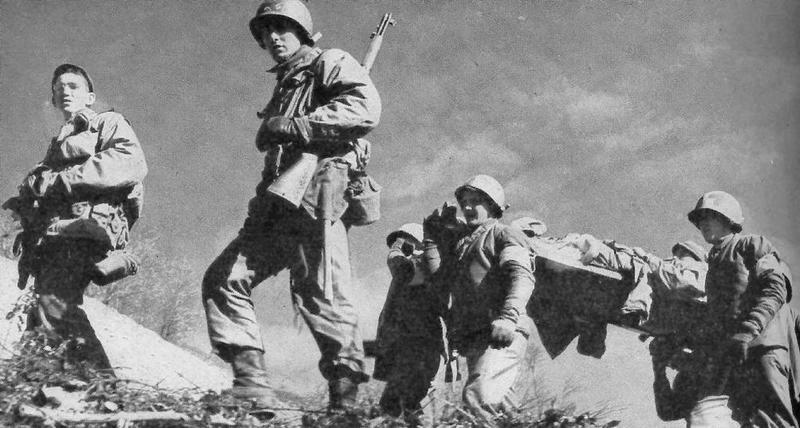 Wounded Marines are being evacuated by LST. 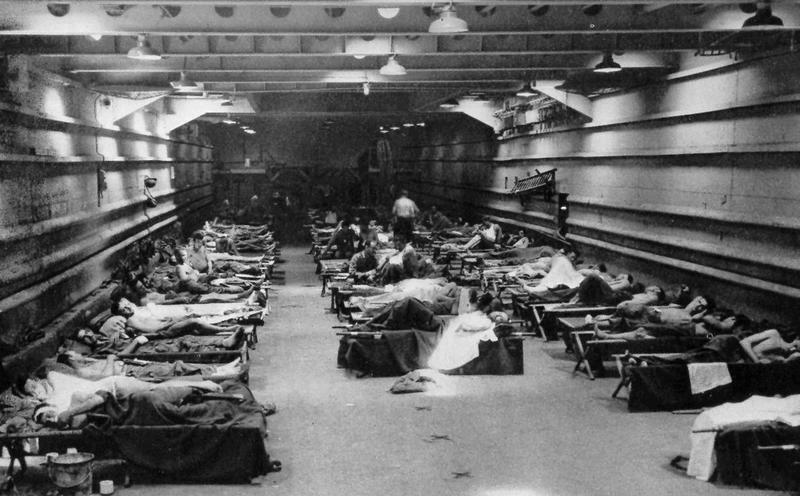 The vessel's tank deck has been converted into a hospital ward for casualties, with designated operating room and sick bay. 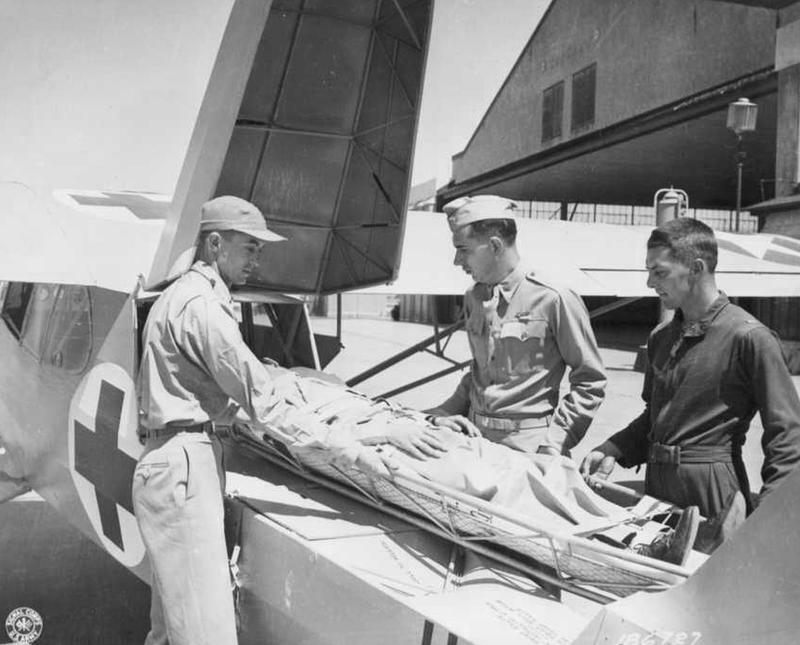 Medics load a wounded serviceman into the rear of a light aircraft for evacuation. Note the use of the Stokes Litter (Item No. 9938500). The plane being used here seems to be a military version Piper J-3 (with the designation of L-4). Army Litter party carrying a casualty . Picture taken in Germany during 1944-45 winter. Wounded soldiers are being evacuated to General Hospitals stateside. 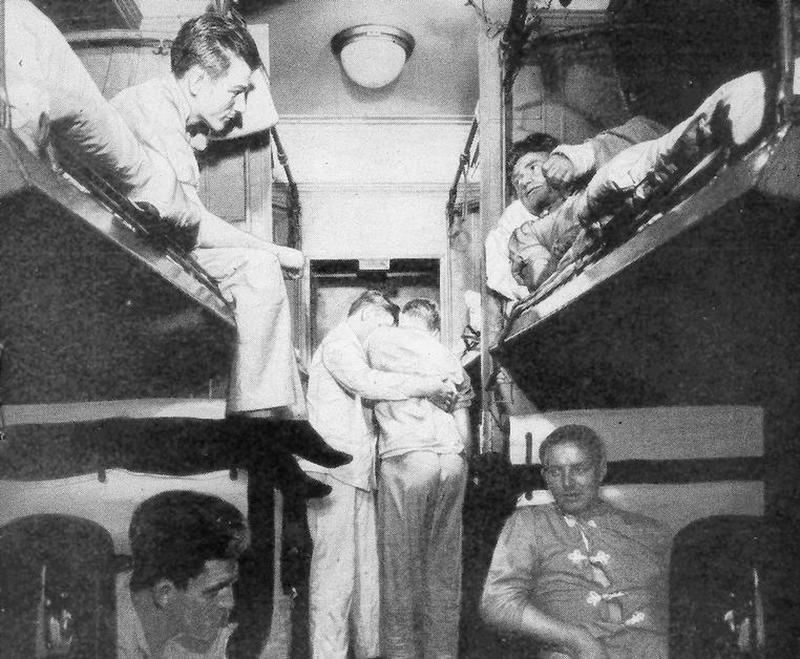 They transit in regular and/or adapted Pullman sleeping cars and represent part of the military load on hospital trains in the Zone of Interior. Picture taken in August 1945.